Barça picked up a vitally important 1-0 win at Real Sociedad on Thursday (highlights below), which sets things up nicely for the Copa del Rey second leg at the Camp Nou next week and a place in the semis for the tenth time in just eleven seasons. The only time Barça missed out on a berth in the last four was in 2010, when they crashed out to Sevilla in the round of 16. There are plenty of reasons to feel optimistic. On the 14 previous occasions that the Catalans have won a cup first leg 1-0 away from home, they have only once failed to go on and progress. Here’s a round-up of some of the other facts and stats that we’ve picked out following the first win at Anoeta in almost a decade. ‘Curse’ lifted. Indeed, the eight previous times that Barça had travelled to San Sebastián had ended in five defeats and three draws. Not since a 2-0 win in 2007 had Barça claimed victory at the home of Real Sociedad. Luis Enrique’s first win. The coach’s record at Anoeta was also negative until Thursday. He had lost there three times (once with Celta and twice with Barça) and the best he had managed was the 1-1 draw earlier this season. 45 years of qualification. 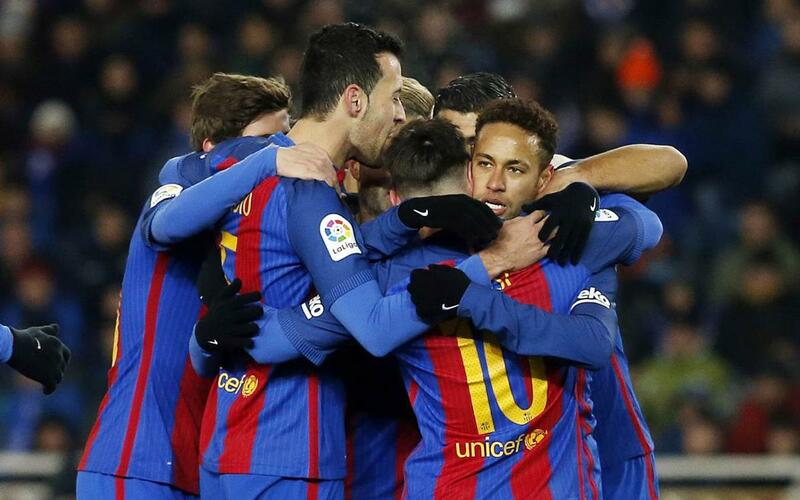 Barça have only once failed to qualify for the next round of the Spanish Cup after winning the first leg 1-0 away from home. That was way back in 1962 against Real Madrid. One of those triumphant occasions was actually against Real Sociedad. A 3-3 draw at the Camp Nou was enough for Barça to progress 27 years ago..
Neymar Jr was omnipresent in the Catalan attack and was brought down for the decisive penalty. He’s been on the receiving end of more penalty incidents (19) than any other player in the squad. Sergio Busquets was one of the most active midfielders of the night. His 47 completed passes were more than any other man on the field, and he also led in tackles with 11. Jasper Cillessen’s long balls proved to be the perfect counter to Real Sociedad’s deep pressure and was the ideal tonic for picking out the spaces they left behind. The Dutch stopper made 33 good passes, 18 of which were punted long, and it was one of those that led to the Neymar Jr penalty.